Droopy eyelid, double vision..after Botox injection, what to do? Botulinum toxin injections can cause side effects due to the spread of the Botulinum toxin to adjacent muscles. They can occur in the most expert pair of hands as the response to Botulinum toxin varies among patients. A given dose of Botulinum toxin will be not enough for some patients, but for others it will too much, responsible for side effects. Side effects occur most often 10 days after the injection, but may occur earlier, 2 or 3 days after injection. All the side effects are transient, lasting on average 4 to 6 weeks after the injection. You can be reassured that all the side effects disappear completely with time. -Droopy eyelid (ptosis) is due to a spread of the neurotoxin to the middle part of the superior eyelid, into the Levator palpebrae muscle. This muscle is responsible for holding up the eyelid. The ptosis, can be mild, covering the top of the pupil only, or more pronounced covering half the pupil; very rarely the eye is completely closed. It happens after injection of Botulinum toxin around the eyes (eg for Blepharospasm or Hemifacial spasm). –The ptosis is different from a droopy eyebrow, which can occur after injection into the forehead for cosmetic injection or facial sweating, and which closes the eye by making the eyelid looking “ heavy”, increasing the skinfold of the upper eyelid. Iopidine eye drop is not useful in this case. -Double vision (called Diplopia) is due to the spread of the Botulinum toxin into the muscles which move the eyeball; if one of these oculo-motor muscles become weak on one side, the patient will see 2 images instead of one, when looking with the 2 eyes; the double vision will disappear when looking with only one eye; the movement of the 2 eyes are no longer synchronous. B lurred vision is often from the same mechanism but less marked, so the image seen by the 2 eyes is blurred. -If double vision comes from spread of the Botulinum toxin injected into the upper lid, the 2 images will be one above the other, (vertical diplopia) and the weakened muscle will be the Superior Rectus in the middle part of the upper eyelid. -If double vision comes from spread of the Botulinum toxin injected into the lower lid, the 2 images will be one above the other (either vertical or oblique diplopia). 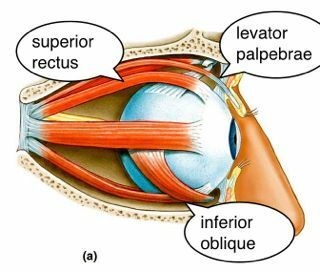 The weakened muscle will be the Inferior Oblique, in the medial part of the lower lid. Double vision can very disturbing, a source of headache and falls as the edge of the pavement, for instance, will be difficult to appreciate. Therefore the patient with double vision has to be careful when walking, and can either cover one eye, or ask his optician for a prism to attach on one side of his glasses to correct the oculo-motor imbalance. It will also disappear spontaneously in 4 to 6 weeks. Tearful eyes are due to dysfunction of the evacuation of the normal tear production by the tear duct, situated on the edge of the lower lid in the corner near the nose. 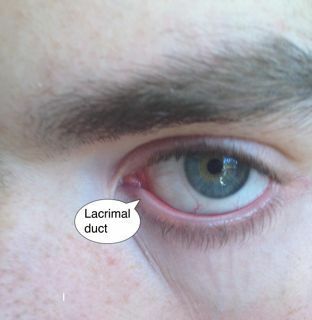 If the lower eyelid is too saggy, the tear duct is no longer facing the inside of the eye and cannot drain the tears. It can be source of blurred vision. – Exposure keratitis is due to difficulty to close completely the eye (lagophtalmos). If the pretarsal injection of Botulinum toxin into the upper lid is too strong for the patient, the eye can be wide open with decreased blinking and difficulty to close completely the eye at night. The eye becomes dry, sore, red, irritated by any dust or other foreign bodies, which are usually cleared from the surface of the eye (cornea) by blinking. Artificial tears during the day, ointment at night, protection of the eye from the wind by wearing large glasses, and closing the eye at night with an eye pad are the protective measures to avoid keratitis. 5- What to do to avoid the side effects at the next session of injections? a. At the next session of injection, the injection sites and dosages should be adjusted to avoid the reoccurrence of any side effect. b. In case of ptosis, the injection can be distanced from the middle part of the upper lid. c. In case of diplopia or tearful eye, the injection of the medial (near the nose) lower lid site will be avoided. d. It may also require delaying the injection more than usual, 14 weeks instead of 12 weeks for instance, instead of decreasing the dose too much. A low dose could have no side effect but also have no effect on the dystonic spasm. Therefore, it’s very important that the patient documents precisely the nature of the side effect, in particular if the patient is not seeing his doctor in between 2 sessions. 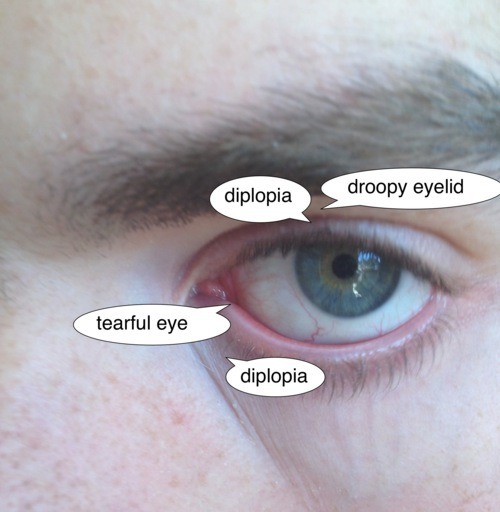 Pictures of the face for the droopy eyelid, description of the double vision at the time of the event, will be very helpful for the doctor when adjusting the next dose. Again, every patient responds differently to the injections, and it may take sometimes 2 or 3 sessions, to customize the injections in order to achieve an optimal benefit without side effect. Don’t lose hope! The side effects never last and the injections will eventually be tailored to your own condition, fitting you like a dress from a haute couture salon! Next Article Swallowing difficulties after Botox injections.What to do and how to avoid them.